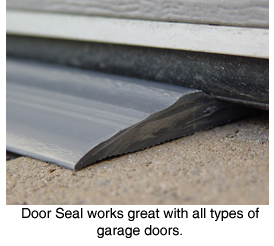 Seal out the elements with this permanent garage door seal from Park Smart! For a detailer, the garage is more than just a place to park your car – it’s a place to relax and enjoy your favorite hobby. It’s the one room in the house that’s all yours. To help keep your sanctuary clean and comfortable, get the Park Smart Tsunami Seal™ Garage Door Seal. The Park Smart Tsunami Seal™ Garage Door Seal is an unobtrusive strip of indestructible vinyl polymers that forms a strong seal between the garage door and the floor. Lock out rain, wind, leaves, snow, and animals. The strip stands ½ inch tall to prevent rain from seeping under the garage door. The wind can’t blow leaves or dirt underneath the door and melting snow won’t find its way into the garage. Rain or shine, your garage will stay dry and comfortable. During the summer months, your garage will stay cooler. In the winter, it will stay nice and toasty because your efforts to heat and cool the space won’t slip out under the door. Over time, the Park Smart Tsunami Seal™ Garage Door Seal will help save you money on energy costs. When snakes are looking for shelter in the winter or when bugs are lurking everywhere in the summer, your garage is off-limits! The Park Smart Tsunami Seal™ Door Seal keeps critters from sneaking in under the door all year. The Park Smart Tsunami Seal™ Garage Door Seal is a great addition to close the gap between the door and a sloping driveway or uneven floor. The seal works with all types of garage doors, including roll up doors, hinged wooden doors, and walk-through doors. The strip is permanently attached to the floor with the Liquid Nails adhesive. The seal is made of tough vinyl polymers. This material is so strong, Park Smart offers a Lifetime Warranty against manufacturing defects to the original purchaser in a residential application. 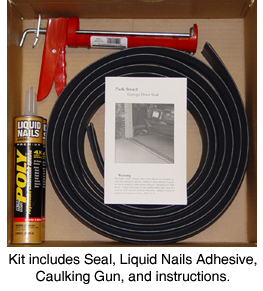 When you order the 10’, 16’, 18’ or 20’ seal, you will receive a boxed kit including the seal, a tube of Liquid Nails Ultra Duty Poly Adhesive, and a metal caulking gun. The seal is available in gray, brown, and black. Keep the elements out of your garage with the Park Smart Garage Door Seal. Park Smart offers many options for protecting and beautifying your garage. See the Park Smart Clean Park Garage Mat for an attractive and affordable solution to cover stained concrete or to protect new concrete. Garage Mats can only ship by UPS Ground Service. Express shipping and International shipping are not available on this item.